Sainfoin (Onobrychis vicifolia) is deep-rooted and very drought-resistant. It yields best on high pH, deep, well-drained soils, and will not withstand wet soils or high water tables. It is not as winterhardy as some cultivars of alfalfa. Sainfoin is short lived where root and crown rots are a problem. Sainfoin has 6 to 14 pairs of pinnate, alternate leaves that are oblong. Sainfoin has pale pink flowers as shown in the photo. It grows taller than alfalfa and it’s stem is hollow. Although very coarse, the forage is highly nutritious. It is not known to cause bloat. Because the plant is rich in tannins, proteins tend to bypass the rumen and be absorbed in the abomasum. It is highly palatable to both sheep and cattle, being preferred over alfalfa. It is relished by deer. 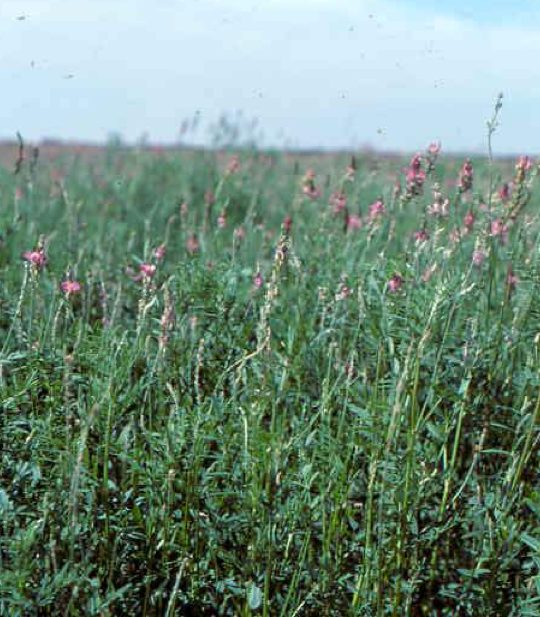 Sainfoin may be grazed or used for hay, either alone or in mixtures with grasses. The “seed” used to establish this crop is actually a pod which contains a single seed. Even without the pod, the true seed is large; there are only 28,000 seeds per pound. The recommended seeding rate is 30 to 40 lbs/acre so seed cost will be about $100/acre. For good establishment and growth sainfoin must be inoculated with a special rhizobium just before planting. Sainfoin does not tolerate competition well during establishment. The vigor of the plants is decreased by clipping during the seedling year so sainfoin should not be harvested in the seeding year. Nitrogen-fixing bacteria have been short-lived or ineffective so that nitrogen fertilization may be required. Sainfoin begins growth in the spring about the same time as alfalfa, but flowers one to two weeks earlier. First cutting hay yields have exceeded those of alfalfa in Montana, but alfalfa yields are greater in subsequent cuttings. Since regrowth is very poor, it is best suited to taking one clipping at about the half- to full-bloom stage. It is not attacked by alfalfa weevil or potato leaf hopper. New varieties of sainfoin have been released in Montana with improved yield, however these varieties have not been tested in Wisconsin. The lack of yield in the seeding year, adaption to high pH, low tolerance of wet soils, and, susceptibility to crown rot causing short stand life indicate that this species is not likely to be useful in Wisconsin. Calculating Production Costs – Per Acre, Ton, Bushel, etc.